The drum dance or "baile de palos" is a couple dance accompanied by the long drums (palos) and their variants. 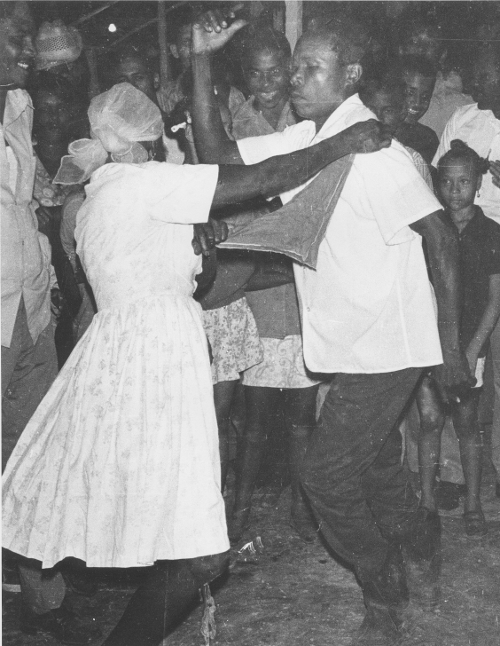 In accord with the sacred nature of the palos, the voice of the patron saint of Afro-Dominican religious brotherhoods (cofradías), the drum dance is called a "dance of respect" ("baile de respeto"), in contrast with the purely social dances, called "dances of enjoyment" ("bailes de regocijo"). The former are traditionally danced unembraced, while the latter are danced embraced and are more overtly dances of courtship. Congos of Villa Mella: balancing step. 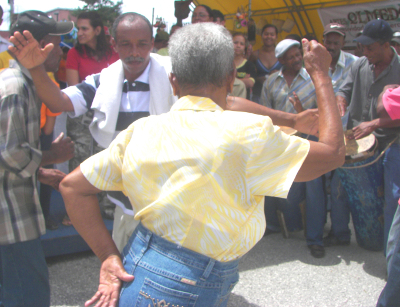 The baile de palos, like the palos themselves, is performed at saints’ festivals (velaciones). It also can be performed for death rituals by some brotherhoods, such as that of the Holy Spirit of Villa Mella with its congos drums, where it is more usual in the anniversary of death than the "nueve días" (“rezo”) which dispatches the spiritual remains on the tenth day following death. Despite substantial regional variation in drum rhythms, the dance itself is similar in all regions and enclaves. 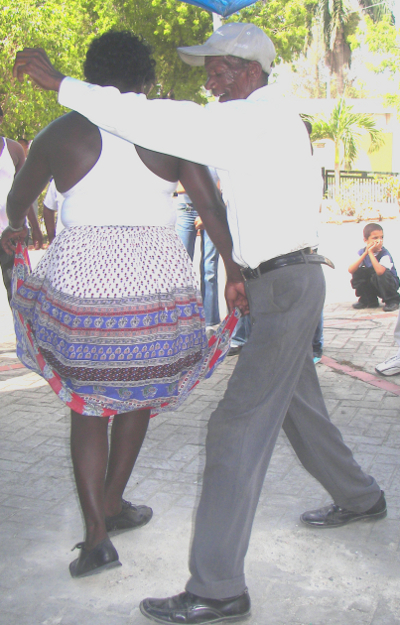 Like Dominican social dance, it, too, is a dance of courtship, but more subtly and elegantly expressed. The couple has no physical contact, except for the man's hand occasionally placed on the woman's shoulder or waist as she turns. One or two couples dance at a time, while the public looks on; both men and women may cut in, to provide participation for all in serial form. Congos of Villa Mella: pursuit step. The baile de palos drum dance is composed of two steps, which are alternated. The first is a balancing step with the couple facing each other. The feet are slid forward, alternating right and left, in a sort of challenge. In the second step, the woman flees from the man, tracing a circular pattern around an axis where the balancing took place, and the man follows in ritual pursuit. Then the initial position is restored and the balancing step repeated; again, the woman launches out in the opposite direction, until the balancing step is once again assumed. So the entire pattern can be seen as consisting of four parts: Balancing, fleeing clockwise, balancing, fleeing counterclockwise (or vice versa). Palo arriba of central-south (Monte Plata): pursuit step. This pattern is the same throughout the country. The variation includes the level of intensity, arm positions, and other slight variations in either of the two steps. The posture is largely erect, with the greatest movement in the feet and some movement in the arms; there is no hip movement if danced correctly. However, in some variants (as in the congos of Villa Mella and the sarandunga of Baní) the man may be slightly inclined at the waist, and, in Villa Mella, have slightly bent knees. Thus it could be observed that the dance, as a couple dance with largely erect posture and no hip movement, is quite European-influenced, in sharp contrast with the drumming; and the woman's drum dance is more European in style than the man's. In the first step, the man's arms hang relaxed at his sides, or tense with elbows bent, depending on the area. The woman may grasp her skirts, traditionally lifting them to reveal a delicately embroidered white petticoat. Congos of Villa Mella: a non-ritual piece: "Pembe yagua." Soloist: Doña Vitalina. The woman may also stretch a handkerchief between her hands, or, in Villa Mella, hold a sash, passed behind the waist by extended arms. In the second step, the man and perhaps the woman may raise a bent arm, leaning in the direction of the turn. Palos del Espíritu Santo (palo corrido), southwest (San Juan de la Maguana): pursuit step: arm position. One hand on the hip and the other poised in the air could be considered a typical Congo pose in Haiti. In Villa Mella, the women's pattern of cutting in is particularly elegant, with the women turning around one another, then one rotating to the sidelines and the other to the center to face the man. Likewise in this area, the balancing step may include a subtle little jerk, by the woman only, as the feet alternate position. With regard to quality of movement, the drum dance is essentially a calm, serious dance, generally neither exhausting nor virtuostic. 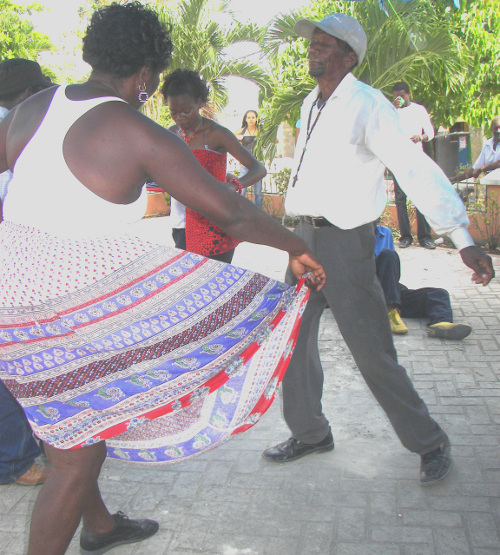 The most sedate dance is that of the congos of Villa Mella, as is the dance to the palo abajo and palo arriba rhythms of the larger enclave of the "Savannah of the Holy Spirit" in which Villa Mella forms an enclave. However, in contrast, the most virtuostic drum dance is the man's role in thesarandunga of the brotherhood of St. John the Baptist of Baní. There, the man changes his weight from foot to foot, leaning in one direction and then the other, with outstretched arms which encircle the woman. This is reminiscent of some Spanish and Canary-Island folk dances, such as the baile de tambor of the island of La Gomera. In the sarandunga, a red handkerchief may be twirled, mainly by the man, to further attract the woman, although occasionally a woman may use one as well. Palo corrido ("Palos of the Holy Spirit") of the southwest (San Juan de la Maguana). The drum dance of the San Juan Valley (interior southwest) to the Palos del Espíritu Santo is also quite lively, danced with side-to-side guaracha-like steps in San Juan, but a fast and energetic walking step in Las Matas de Farfán, where the balancing step is an active challenge before the woman escapes into her circular flight. In areas in which the non-liturgical, creole Salve uses a proliferation of drums, and in the case of Salves con palos at vodú altars, the public may dance. As the use of drums for the Salves should not be considered palos music per se, the dance to this type of music is also not the drum dance. It is largely a couples' dance, using an undefined guaracha-like side-to-side step, and in purpose is recreational and quite akin to social dance. The misterios, when they "arrive" (possess the mediums), dance like the mortals. The rhythm is the same for all deities—what vary are the melody and the text; likewise, the dance is the same for all pieces.